This semester, in addition to posts about teaching and research, I’m planning to write some on planning. For me, this is key to having the mental space to spend a lot of time thinking about learning and the time to actually act on those thoughts. First up is my semester plan! Why a semester plan? A semester plan essentially lets me see everything I have going on that semester all at once. While this can be overwhelming, taking it in all at once lets me plan ahead for deadlines, not let things accidentally fall through the cracks, make time for my goals (like curriculum development! ), and only do the things I really care about (at least in theory). 1) Dates: These are all the relevant dates in my life, including work, dance, and family events and deadlines, and they are all color-coded. 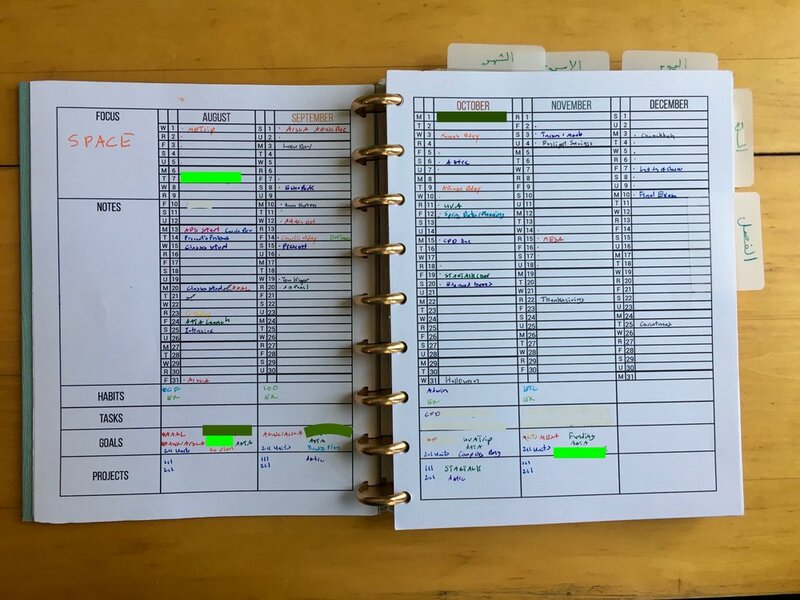 Laying it all out at once allows me to get a sense of when there is space in my schedule and when there’s not, which gives me more realistic expectations for what I can do during the semester. 2) Focus: I also choose a specific thing I want to focus on for the semester, usually one very general word. This Fall, it is space—I would like my physical, digital, mental, and time environments to have more space in them—wish me luck! Habits: Ongoing things I want to do to improve my life that don’t really have an end date. For example, attending Crossfit three days a week and following a good family evening routine are my current habit projects. Tasks: Things that can be completed in one block of time that aren’t linked to a larger project or goal. For example, my continuing professional development paperwork for being a dance judge, or an article review. Goals: These are things that I want to do to improve my life that can be completed, such as submitting a journal article or developing a curriculum unit. However, they can’t be completed in a single time block. So while they may have a specific deadline, I have to plan pretty far out ahead to make sure I spend enough time on them to accomplish them by that deadline. Projects: For me, the difference between a project and a goal is whether it’s a stretch to do it. For example, teaching my classes is a project, but developing new research-based curricular units for them are a goal. To choose what goes in these categories, each semester, I balance between what I’ve already committed to (such as conferences or paper deadlines) and what I’d like to add (so many things!). Once I generate this list, I try to decide what will be realistic, and select only those things to go on my actual plan, making sure to also leave space for things that will come up. Then, I try to balance them across the different months of the semester, rather than trying to work on everything at once. Each month, I evaluate what’s happened, and adjust my plan from there. Do you make a semester plan? If so, how? Let me know—as you might imagine, I also love reading about other people’s plans . . .